Imo, E. O. *, Orji, J. C. and Nweke, C. O. Department of Microbiology, Federal University of Technology, Owerri, Nigeria. *To whom correspondence should be addressed. E-mail: ejeagba@yahoo.com. Received 10 May, 2018; Received in revised form 23 May, 2018; Accepted 29 May, 2018. Fungal corrosion, Biofilm, Metal, Corrosion rate, Mycelia, Electrochemical, Gravimetric. Growth of fungi and indeed microorganisms on metal surfaces can initiate, facilitate and accelerate corrosion reactions, altering the composition and integrity of such metal without changing its electrochemical nature. 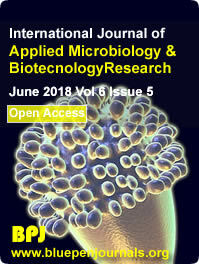 Studies on fungal influenced corrosion (FIC) of mild steel (MS) and aluminium (Al) in the presence of Aspergillus fumigatus were carried out using gravimetric techniques. Mild steel (C-0.30%, Si-0.30%, Mn-0.30%, P-0.045%, S-0.050%, Cr-0.064%, Cu-0.040%, Ti-0.04% and balance Fe) and aluminium (Al >95.5%) plates, 2×2×0.14 cm and 3×1.5×0.1 cm in size respectively, were contaminated with the fungi in Petri dishes with nutrient medium imitating organic pollution. The results obtained reveal that the metals reacted differently to the impact of A. fumigatus. The influence was dependent on the capacity of fungi to grow and develop on the metal surface, and produce metabolites that stimulate changes in polarization resistance and destruction of the metal surfaces. The potentiodynamic polarization profile in the presence of A. fumigatus showed a rise in corrosion current density (Icorr) from 187.95 and 153.5 μA/cm2 (in the absence of the fungi) to 279.4 and 201.2 μA/cm2 (in the presence of the fungi) for mild steel and aluminium, respectively. The gravimetric analysis further revealed that the corrosion and weight loss of the metals increased with time.